This convivial image is the result of a simple question I asked the bridal party: Who wants to give the bride a congratulatory hug? 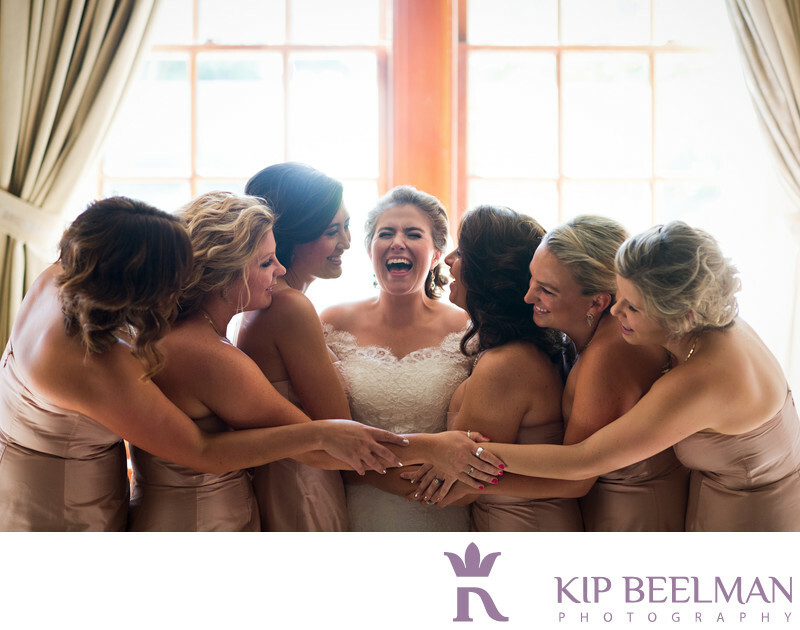 Clearly, six delighted bridesmaids and one happy bride were all thrilled to join in the embrace. This fun-filled event took place in Seattle with scenes from the Hotel Vintage, the Seattle Public Library and Villa Academy wedding photography to commemorate the biggest day. The bride, groom and their parties spent the morning getting ready at the Hotel Vintage in downtown Seattle, which is filled with well-lit rooms, updated décor and a sense of anticipation – Hotel Vintage wedding photography is also stunning. We were awarded a first look at the remarkable Rem Koolhass-designed Seattle Public Library for additional wedding day photos, and then the entire bridal party piled into the “Big Woody,” recognized as the perfect bus for any event and a fantastic way for wedding parties to get around because it blends limousine service with a party bus feel, including natural light, a warm interior and music options for building energy and atmosphere. With Big Woody on our side, we traveled to the chapel at Villa Academy, which boasts high-arched ceilings, magnificent stained-glass windows and a touching wedding location. After the emotional ceremony, the bride and bridesmaids were talking and celebrating as they waited in front of this gorgeous, light-filled window. The resulting hug was just one sweet piece of a day dotted by joy, beauty and union. The Georgetown Ballroom wedding reception was filled to the brim with eager guests looking to celebrate and party with the wedding couple into the small hours in this unique, industrial wedding event space. Location: 5001 NE 50th St Seattle, WA 98105. Keywords: Church Wedding (21), Indoor Wedding (6), Seattle (111), Washington (15).